Top Sheet: How do I link trade sheets and external scope sheets to my top sheet? You can link multiple trade sheets (electrical, drywall, etc.) to one Top Sheet. This aggregates all the bid data into one place. 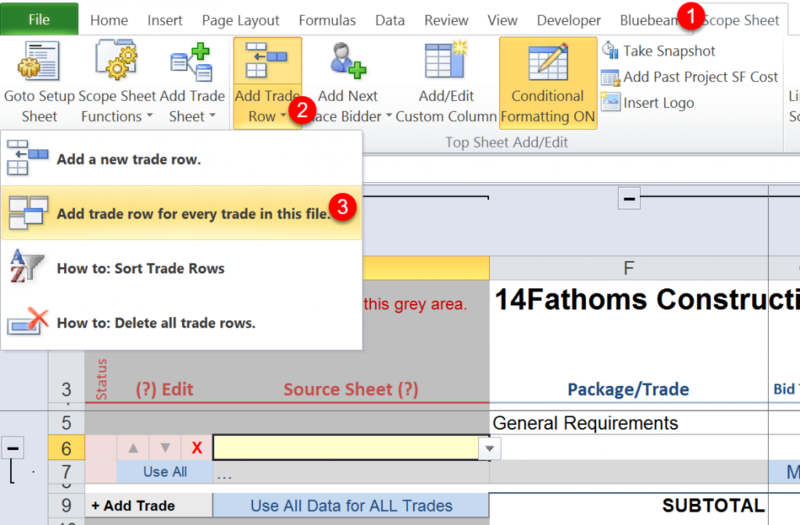 Data is pulled into the Top Sheet using the trade sheets in the same file as the Top Sheet AND/OR from external trade sheets in your coworker’s Scope Sheet file(s). 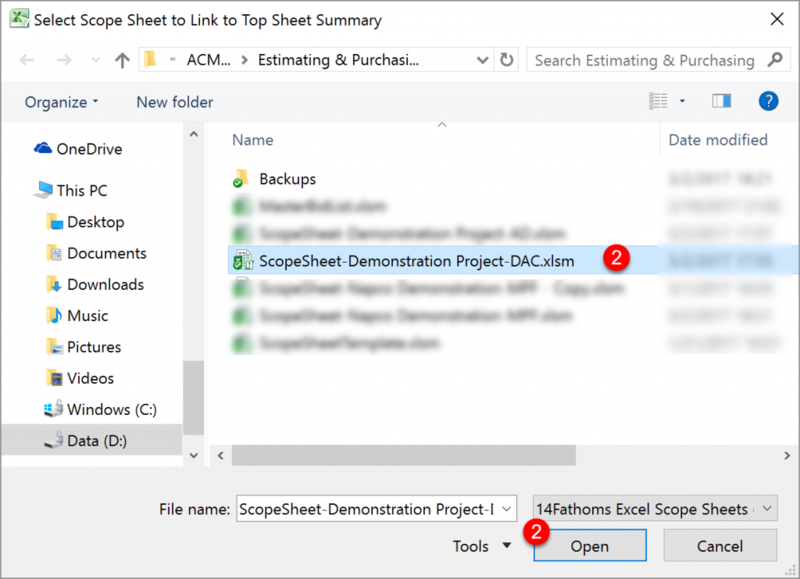 Note: To link external scope sheets you first need to create separate scope sheet files for each team member. Say, for example, the chief estimator is handling the site work trades, another team member is doing the architectural trades, and a third estimator is focused on the MEP trades. 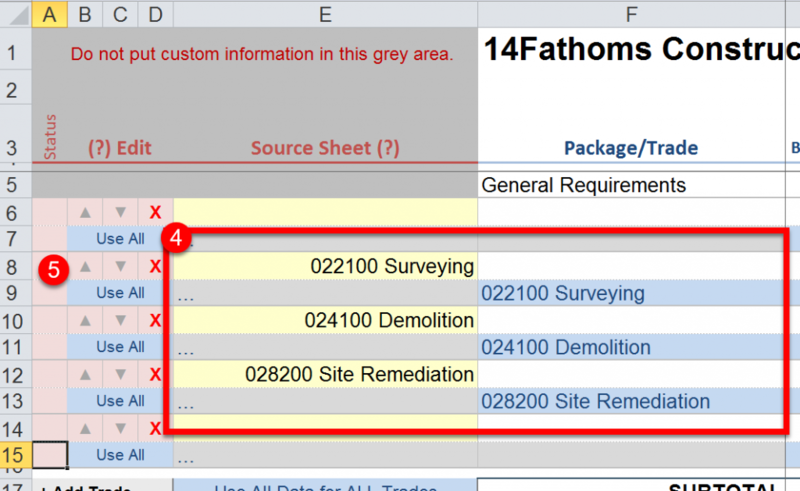 If you haven’t created the files for each estimator, see the “Create Scope Sheet for a Coworker” FAQ first. 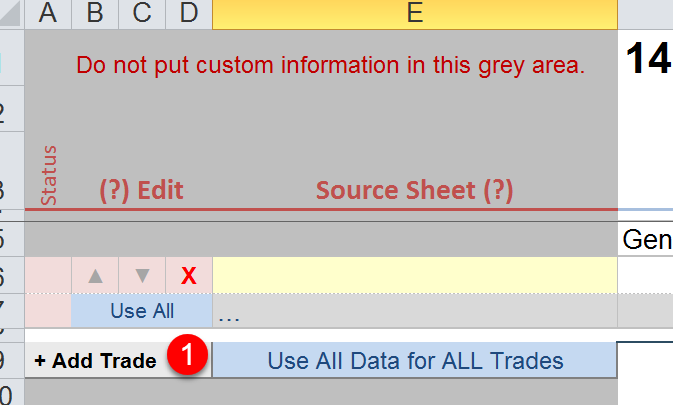 If you’ve already created the files for your coworkers or if you don’t have any external Scope Sheets (one estimator is doing all the trades) please continue. Click the Scope Sheet Toolbar. Click the down arrow on the “Add Trade Row” button. To remove the blank, top line, double click the Up arrow in the Surveying line. The blank line will move down then double click the red “X” on the blank row. Double click the “+Add Trade” button for each trade you want to add. 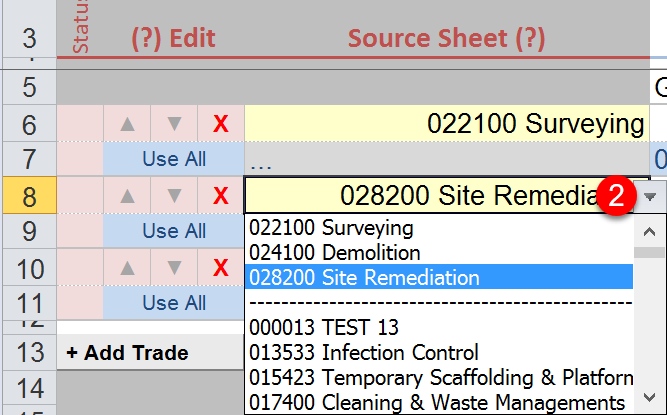 Use the drop down in the yellow shaded cell in the Source Sheet column and select the trade desired trade sheet. On the Scope Sheet toolbar click “Link External Scope Sheet”. 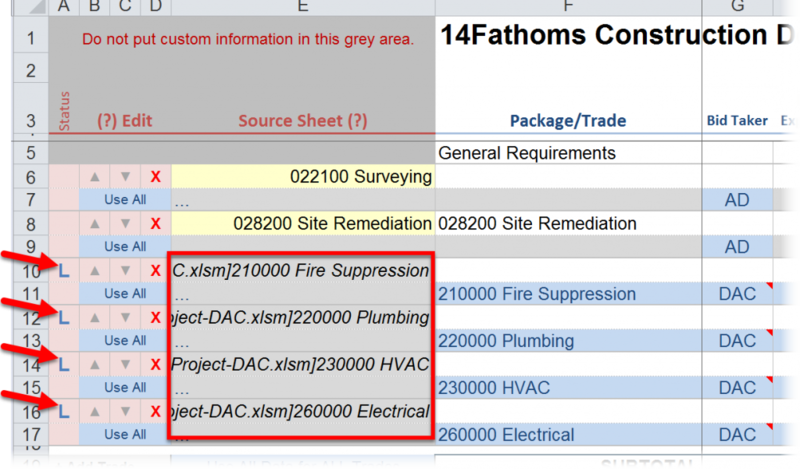 Select and open the estimator’s scope sheet file. The trade sheets in that file will be linked. If the trade already exists in the top sheet it will not re-link it. The “L” in column A indicates the link is functioning properly. Optional: Repeat the link procedure for the other estimator files working on your project. Optional: You can move the linked trades by double-clicking the “Edit” button to the left.